I can’t believe one week has passed since I posted my last Mommy Moments entry! Anyways, the theme for this week is “Treasured Pictures,” photos of our kids that we truly love and cherish. I have already posted most of my treasured pictures in my other entries for Mommy Moments, so I looked for a few that I haven’t used yet. My husband and I simply loved this photo of Justin. This was taken when he was just 2 months old. He looked so young, so sweet, and simply adorable. Don’t you just love to hug a chubby baby? Justin was 3 months old in this picture. That’s his Tita Meme, my younger sister, beside him. 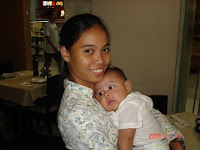 Even when he was only 4 months old, Justin already loved his Ate Ayie, my niece and Justin’s older cousin. Click on the badge above to see more treasured photos. This entry was posted in Mommy Moments, Treasured Moments, Treasured Pictures. Bookmark the permalink. yes, love niya being with her Tita and Ate. 🙂 Happy weekend, Tetcha! I love the chubby stage too! Babies are so adorable…and you will see that certain connection between Justin and his tita. Oh, I truly love chubby babies… sarap i-hug! Lovely photos Mommy! Happy weekend! I'd like to take this opportunity to invite you to join me on Monday (my birthday) as I launch my new photo blog with a new meme. 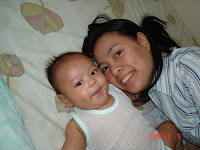 Ang taba pala ni Justin nung baby pa sya & I love to ug chubby baby too.